I finally got around to attaching my I-gotu GPS tracker to Tuffin to see where he goes. 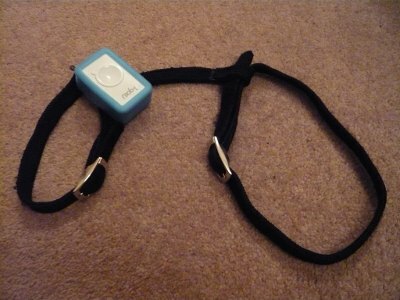 I cleared the device, charged it and attached it to his harness, ending up with a setup like this. He didn't like it to start with - it's the same colour as his fur and he kept licking it as he thought it was his own body. Still, the battery was charged, the cat ready so I put some black tape over the GPS receiver and let him go. He got stuck heading out of the cat flap as he left due to the tracker adding an extra 20mm to his height but after trying again he made it through. After a nervous wait he returned an hour or so later, with the GPS tracker intact, power light still on. Eagerly we plugged the tracker in and dumped the data - waypoints appeared - woohoo! 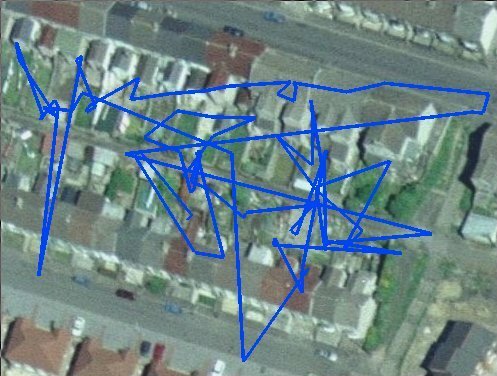 It was logging data every 6 seconds and there are 3 erroneous readings from looking at the map, but you can still see he visits the back of around 9 houses, sits on sheds and uses the alleyway in between the rows of houses.